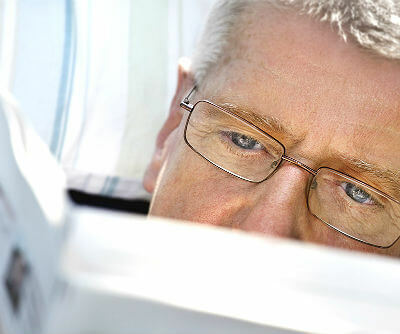 Presbyopia is an eye condition which normally sets in when we reach 40. In essence, it stops the lenses in our eyes from focusing on objects which are close to us. This makes it difficult to do close up work such as reading. To correct presbyopia, there are a range of options available. These involve wearing glasses or contact lenses or surgery. The most common form of treatment for the eye condition is to wear glasses or contact lenses. Often, the lenses will be either bifocal or progressive addition lenses. Unlike bifocals, progressive or multifocal lenses do not have a visible line between the near and distance correction parts. These types of prescription lenses accommodate distance vision, and bring close up objects into focus. This not only helps you see generally but relieves the eye strain which leads to headaches and other discomfort. It could be the case that your condition is mild, and you only need to wear glasses when you perform close up work such as reading. If you wear contacts for distance vision only, often you may be prescribed reading glasses to work in conjunction with your contact lenses. As presbyopia tends to get worse over time, our prescription changes and so do our corrective lens treatment needs. There is a range of surgical procedures which can be used to treat presbyopia. Often they are used to treat one eye. This enables one of your eyes to see objects in the distance, and another to see objects which are close to you. This is called a monovision treatment. CK Treatment uses radio waves to induce the cornea to become more curved. This is a good remedy if you require a ‘plus’ prescription to see objects which are near to you. Normally, this is a monovision treatment. LASIK uses a laser to correct our vision. This treatment improves our vision and can be used as part of a monovision treatment programme, with one eye treated for distance and one for close work. Suitability will depend on your eye prescription and can be discussed at an initial assessment. This form of corrective vision surgery – also known lens replacement surgery – as replaces our natural lenses with an artificial implant to help us see. There are different types of lenses available. Though it sounds a little drastic most people are astonished at how well they can see after undergoing Refractive Lens Exchange/Lens Replacement. As you can see suffering with presbyopia is not the end of the world as there a range of treatment options available.